I got a head start on my new years resolutions after Thanksgiving (goodbye rib-crushing Spanx! ), and tried to make some new recipes that were very healthy and low in calories, but just as savory and filling as my not-so-low-calorie dishes. And I think I nailed it. 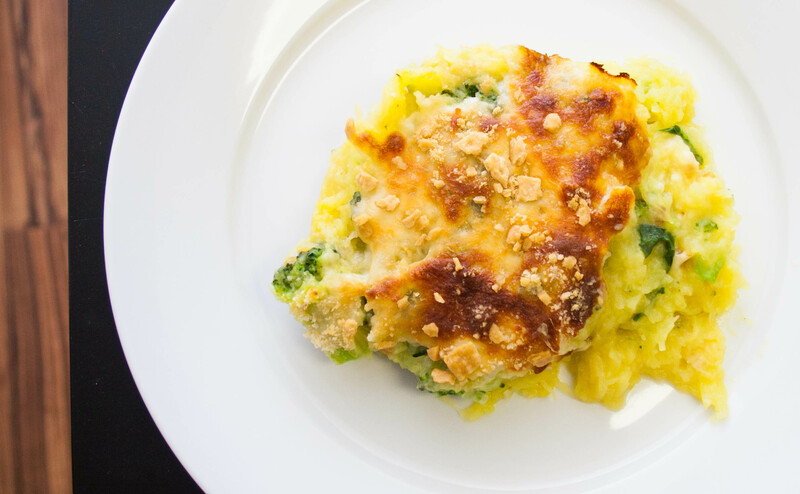 This is a super easy weeknight dinner, and allows you to get that delicious full fat cheese and sauce that will satisfy your appetite, without the calorie count. Which is good, because Bertolli Alfredo sauce is my #1 guilty pleasure/addiction…possibly to the point that I should get some help. If you’re trying to eat healthier, or even if not, and want something creamy and delicious, try it out as a side dish or the main meal! Makes 4 servings, approx 210 calories per serving!! Start by steaming the broccoli florets for a couple minutes, either on the stove or in the microwave, whatever you prefer. 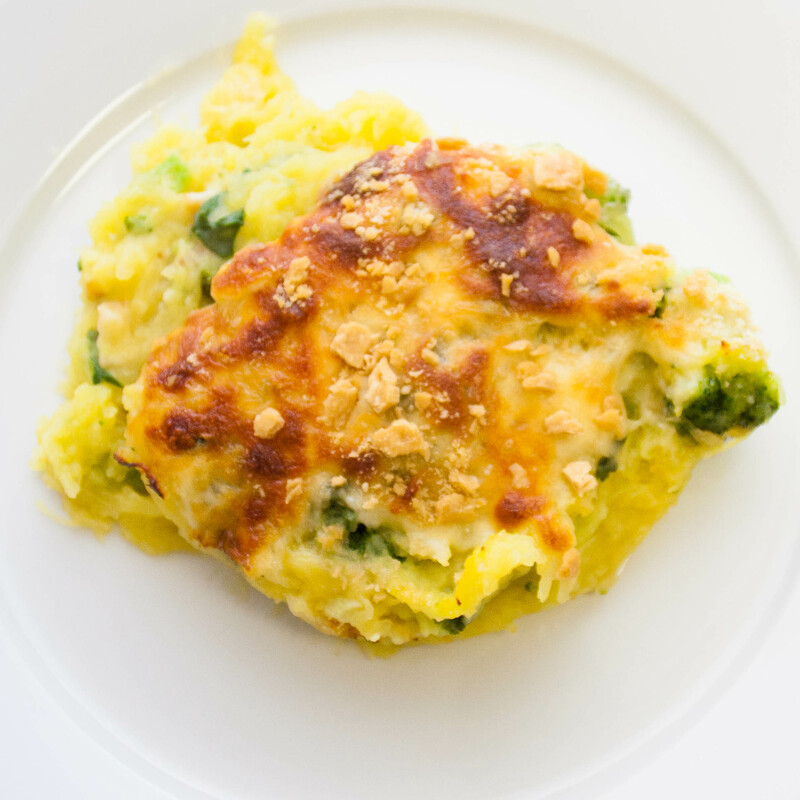 Bake your spaghetti squash lickety-split by placing it on a microwave safe plate. Stab it with a knife on all sides. Please exercise control and do not accidentally stab your own fingers. Place in microwave on high for 10-12 minutes (12 if it’s a large squash). Once the squash is baked, cut it in half lengthwise, scoop out the goopy bits and seeds and throw them away. Then, scrape the sides of the squash with a fork to get all the delicious spaghetti squash flesh (not as weird as it sounds) and place in a large bowl. 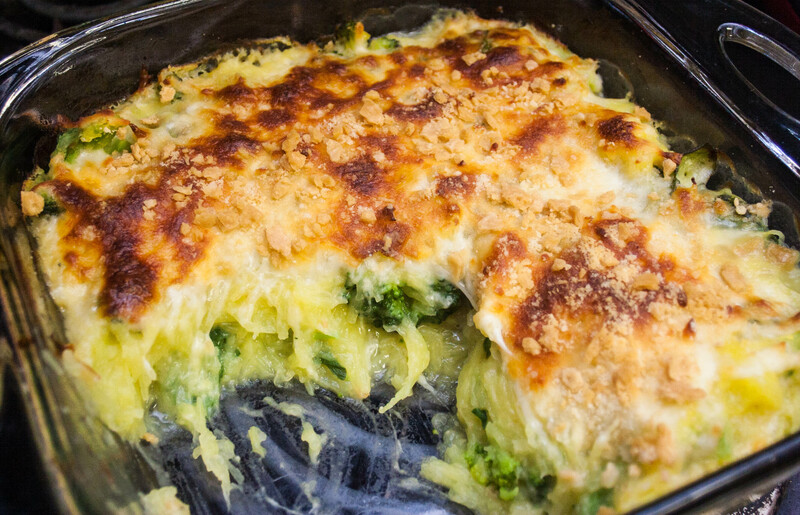 Mix the spaghetti squash “noodles” with the broccoli, spinach, alfredo, and half of the mozzarella. Stir until all ingredients are well integrated. Spread the squash mixture in an 8×8 or 9×9 deep baking dish. 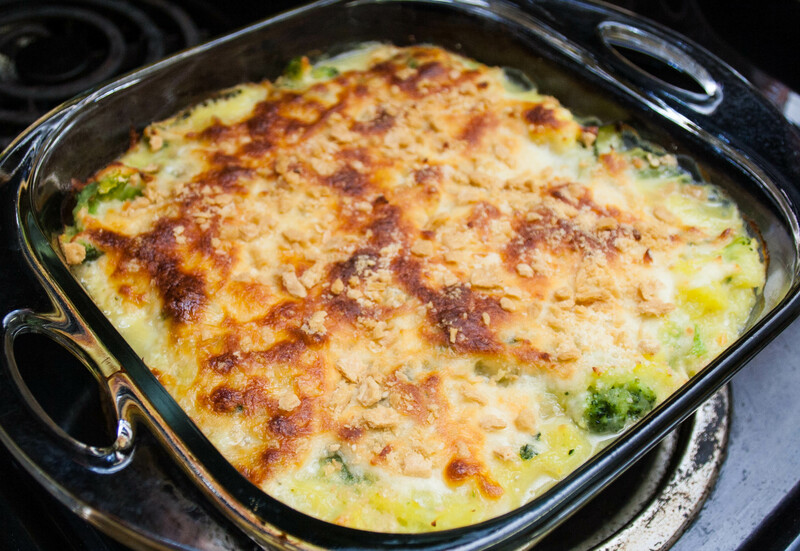 Top with the remainder of the mozzarella cheese, parmesan cheese, and crushed crackers. Bake at 425 for 25-30 minutes, or until bubbly and golden brown. Serve as a side with a high protein meal, or make this your whole dinner! Enjoy! I realize this is an older post, but I’ve been reading over your spaghetti squash recipes and notice that in your pics your end results don’t look watery. I have a lot of trouble with that when trying to incorporate spaghetti squash into a casserole type recipe. Are you doing something magic? I’m so sorry it’s taken me this long to reply! I wish I could say I was doing something magic, but I suppose I’ve just gotten lucky! My suggestions would be to try cooking the squash for less time. I’ve noticed that if it’s cooked too long, the “noodles” get a bit mushy, like they’ve absorbed more water, and once it’s in a casserole that water might release. You could also try absorbing some of their moisture. After you cook the spaghetti squash, lay the “noodles” out in a layer on a cutting board, and press with a towel or paper towels to get some of the water out.